Doctors need to have “full and frank” discussions with patients about the potential risks and benefits of using direct-acting antivirals (DAAs) to treat hepatitis C in late-stage liver disease, especially among those waiting for a liver transplant, liver specialists said at the 2016 International Liver Congress in Barcelona on Thursday. Direct-acting antiviral treatment may not eliminate the need for a liver transplant or significantly prolong life in cases where a transplant is not available. Experts were commenting on a large Spanish study of people with advanced liver disease who have received DAAs since 2013. Although DAAs have produced high cure rates in people with hepatitis C who have advanced fibrosis and cirrhosis, there is still caution regarding their use in people with decompensated cirrhosis who are candidates for liver transplant. Use of ribavirin alongside DAAs in these patients is considered risky, and the extent to which DAAs can improve liver function in advanced liver disease in people awaiting a liver transplant is unclear. Spanish researchers presented findings from patients enrolled in the Hepa-C registry, governed by the Spanish Association for the Study of the Liver and the Networked Biomedical Research Centre for the Study of the Liver and Digestive Diseases, Spain. The registry recorded treatment outcomes in 843 people who demonstrated clinical symptoms of advanced liver disease, had liver cirrhosis and had not received a liver transplant during or within 12 weeks after treatment. The study cohort consisted of people with Child-Pugh A (compensated) cirrhosis and 175 people with Child-Pugh B or C (decompensated) cirrhosis. Those with Child-Pugh A had a median MELD score of 8; those with Child-Pugh B or C cirrhosis had a median MELD score of 15. MELD score predicts the risk of liver disease in patients with end-stage liver disease and helps to prioritise allocation of livers for transplant. The score ranges from 6, for those with less severe disease, to 40, for those who are critically ill. The score determines how urgently someone requires a transplant within three months and takes into consideration results from three routine lab tests. Participants in the cohort received a variety of interferon-free regimens. Forty-five per cent received sofosbuvir and simeprevir, 22% sofosbuvir and daclatasvir, 16% sofosbuvir and ledipasvir, 10% ombitasvir, paritaprevir/ritonavir and dasabuvir, and the remainder received other DAA regimens. The majority of patients also received ribavirin. Sustained virologic response data 12 weeks after completion of treatment were available for 595 cohort participants, and showed that people with Child-Pugh A cirrhosis were significantly more likely to be cured when analysed by intention to treat (i.e. the cure rate among all those who began treatment, regardless of whether they completed treatment or not). 94% of those with Child-Pugh A cirrhosis were cured (402/428), compared with 78% of those with Child-Pugh B or C cirrhosis (102/131). The difference was due to a higher rate of virologic relapse after treatment and a higher frequency of deaths in those with Child Pugh B and C cirrhosis. People with Child-Pugh B or C cirrhosis were also more likely to experience severe adverse events during treatment, including the development of liver decompensation, anaemia requiring transfusion or other adverse events. Severe adverse events during treatment and post-treatment mortality were predicted by a MELD score of 18 or above, such that only 68% of those with a MELD score of 18 or above were alive 36 weeks after starting treatment, compared to 97% of those with MELD scores below 18 (p < 0.001). 25% of patients with the most severe disease died compared to 1.6% of the rest of the patients (p < 0.001). On average, positive or negative changes in MELD scores after treatment were modest, and Dr Fernández Carrillo pointed out that for over 90% of patients, the changes were too small to be clinically meaningful. However, a smaller multicentre European study of 103 people with decompensated cirrhosis on the liver transplant waiting list found that 20% experienced improvements in MELD scores of four points or more after DAA treatment, allowing them to be taken off the liver transplant waiting list altogether within a year of beginning DAA treatment. But, for the remaining 80% a liver transplant continued to be an urgent necessity despite a high cure rate. Study presenter Luca Belli of the Gastroenterology and Hepatology Liver Unit, Niguarda Hospital, Milan, Italy, warned that longer-term follow up is still needed in people taken off the transplant list to see whether the benefit of treatment persists. “The results of our study clearly show that those patients suffering from very advanced liver disease may not obtain benefit from these treatments,” said Dr Carlos Fernández Carrillo, Liver Unit of Puerta de Hierro-Majadahonda University Hospital, Spain and lead author of the HEPA-C registry study. “We believe that in these severe cases, a discussion must take place between the healthcare professional and the patient, to make an individual decision. Sometimes it could be better to let the condition run its natural course rather than intervene and risk severe adverse events or death before curing the hepatitis”, added Dr José Luis Calleja, the senior study author. “This study highlights the risks of using direct-acting antivirals in patients with severe liver disease. 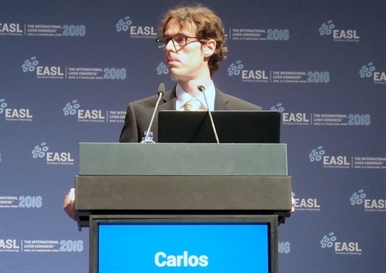 It is important that hepatologists weigh up the risks and the benefits of treating patients with late-stage disease, and have open and honest discussions with their patients as to the best course of treatment for them,” said Professor Laurent Castera, EASL Secretary General. Another option is to increase the supply of livers available for transplant to people with hepatitis C virus (HCV) by transplanting livers from donors with HCV. A review of the Scientific Registry of Transplant recipients also presented at the International Liver Congress on Thursday showed no significant difference in post-transplant mortality or graft rejection between people with hepatitis C who received livers from HCV-negative or HCV-positive donors in the United States between 1995 and 2013. The study compared outcomes in 1930 people with HCV who received organs from HCV-positive donors and 31,738 who received organs from HCV-negative donors. The study found that the proportion of people with HCV who received organs from HCV-positive donors increased from 2.9% in 1995 to 9.4% in 2013. Belli L et al. Impact of direct-acting antiviral agents on inactivation / de-listing of liver transplant candidates listed for decompensated cirrhosis: a European study. International Liver Congress, Barcelona, abstract PS036, 2016. Fernandez-Carrillo C et al. Treatment of hepatitis C virus in patients with advanced cirrhosis: always justified? Analysis of the HEPA-C registry. International Liver Congress, Barcelona, abstract GS01, 2016. Stepanova M et al. Long-term outcomes in liver transplant recipients transplanted from HCV-positive donors. International Liver Congress, Barcelona, abstract PS040, 2016.